We all know that the foundation is one of the most important parts of your home. The stability of your foundation is key to the overall healthiness of your home. The other thing we all know is that for most people, their home is their biggest investment. Atlas Piers can help you know the signs for foundation failure, and also be your number one source for all your foundation repairs in Atlanta needs. There are multiple solutions available for your foundation repair needs. The specific solution depends on the problems observed in your home. Underpinning is a common solution used in many repairs, from wall cracks to sloping floors. With underpinning, helical or resistance piers are inserted under your home to lift and hold your foundation stable. Underpinning is a durable, life-long solution that is designed to lift your foundation to its original state. These piers can be installed in any weather and disturb your home very little. Helical piers can be screwed into the soil in hard to reach places, making them ideal for any foundation repair project in Atlanta. Another option is helical tiebacks. Helical tiebacks may be used if your shifting foundation has caused your walls to bow or lean. These are installed to distribute pressure more evenly and keep heavy soil from pushing on your walls. A helical tieback includes a plate that is placed on the wall inside your home and a rod that is inserted diagonally through your wall into the soil outside. These tiebacks will support your leaning or bowing wall while pulling the wall back into its original position. 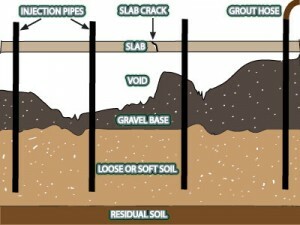 Pressure grouting is used when there are large gaps beneath your foundation, slab, sidewalk, or driveway. The gaps are often caused by sinking soil that can leave inches or feet of free space beneath your concrete. This makes the concrete incredibly unstable and prone to cracking and sinking. This can be a safety hazard. During pressure grouting, Atlas will drill holes into your concrete and insert a highly pressurized concrete. This is much cheaper than removing the concrete, filling the gap, and pouring new concrete. It will fill the air gaps beneath your concrete. If you notice a problem with your foundation, don’t hesitate to call. We only install the best in foundation repair equipment from Earth Contact Products, so our solutions are affordable and durable. Atlas Piers of Atlanta will be more than happy to come assess your situation, give you a free estimate, and provide you with the best solution. Call Atlas Piers of Atlanta for more information.